Guild banks is the #1 asked-for feature concerning guilds. It will be the first thing they work on post-launch. No guild events calendar feature in game at launch. High priority. Guilds will be brought into testing to test endgame. No in-game mechanics for guild adversaries and allies to interact. There is talk of integrating the guild webpage features into the game, but can’t discuss. More James Ohlen and Comments after the jump. Socialization is encouraged through various, easy-to-implement features. Chat has been revised to make it easier for people to talk to each other. When the reward panel for a quest pops up there is a button that automatically adds the people in your party to your Friends list. Designers are tweaking the auction house in response to testing feedback. Chat bubbles are good for RPers and new players.“We really want chat bubbles for ship, but I’m not going to promise it,” said James. Accruing social points through multiplayer dialogue helps you gain ranks in social attributes. These ranks unlock social items for purchase from social vendors. Social items are fun, not for stats. Social armor is mainly for customization of appearance. Light/Dark system assumes you make choices more for RP purposes than for stats. Most Light/Dark options opened lead to visual differentiation, not abilities or gear stats. Gear for Neutral alignment might not be in at launch. Designers did not want players to worry about stats when making Light/Dark choices. Designers are adding the ability for a group leader to distribute loot. Two difficulties for flashpoints and operations. No plans for medium difficulty. Not many people skip through dialogue, especially when it comes to class quests. Sometimes in groups, players skip because of the social pressure of other players trying to rush through. No real way to insert story into warzone – it’s more about creating the setting or mood (i.e. Huttball announcer). Story will continue to be a centerpiece of the game in future expansions, and in content between expansions. Item mods is one of the more complex part of the game systems. Your first Lightsaber is moddable. If you want, you could take that Lightsaber all the way to 50. Mod system is still being tweaked. What is in at launch will be different from what is being played now. Instancing feature for overpopulation has been modified. Players that want to play in the same instance can now reset without cooldown, and no without travelling to a new location. Instancing will be used heavily in the first week after launch, should be used less as time passes. Some discussion on opening up class-phased areas to everyone. Not at ship. Some achievements in the game. More will be added. No reputation grinds because it adds another complexity factor to the already complex story system. Affection Rating will not affect crew skills. AR has the ability to unlock companions’ stories, available quests, romance options. Almost identical to Dragon Age affection system.. Abilities not limited by environment – no inside or outside abilities. Use of metrics, focused tests, visiting forums help devs sort through testing feedback to see which comments are valid. All BW employees play the game. All senior designers are very active in getting feedback from a variety of sources. Daniel, Georg, Gabe send James links. There will be a Public Test Realm. Why do you think other MMOs fail? Terrible launch, security issues, a tendency to go too far either to the MMO side or to the single player side. Cyborgs confirmed as a playable race. Racial ability scans people with their cyborg eye. 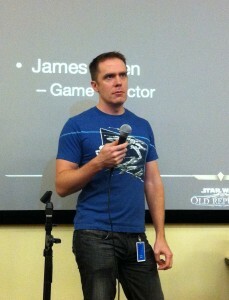 James likes the idea of a BioWare convention, but nothing official to announce. Collector’s Edition items can be obtained only by buying the CE. For full audio, visit TORWars .